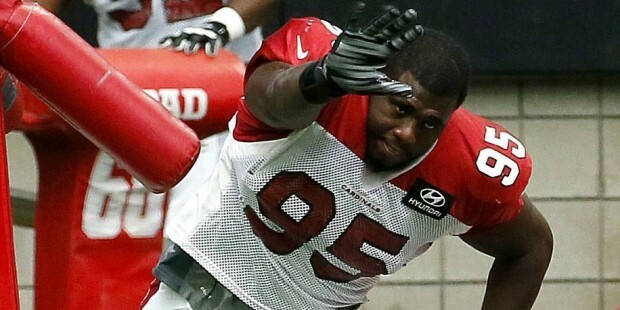 The Arizona Cardinals re-signed free agent tackle Rodney Gunter to a one-year contract on Monday, solidifying another rotation piece on the defensive line. The team also announced it has signed one-year contracts with tight end Darrell Daniels and offensive lineman Jeremy Vujnovich, who were both exclusive rights free agents. Alliance of American Football offensive linemen Andrew Lauderdale and Jeremiah Poutasi additionally agreed to one-year deals with Arizona after the upstart football league released them to join NFL teams this past week. Gunter, who reportedly received interest from the Green Bay Packers as a free agent, has been with the Cardinals since coming out of the 2015 NFL Draft as a fourth-round pick from Delaware State. In his four seasons with the team, he has recorded 95 total tackles, 8.0 sacks, two forced fumbles and a fumble recovery. The defensive tackle put together his best season in 2018, making a career-high 44 total tackles. He added 4.5 sacks, tying Robert Nkemdiche for second on the team behind only defensive end Chandler Jones (13.0). With Nkemdiche suffering an ACL injury toward the end of 2018, Gunter will likely be leaned upon heavily to start 2019. He joins a front headlined by vetern Corey Peters and free agent addition Darius Philon. Daniels, a 6-foot-3, 246-pound tight end, played in two games last year and brings depth behind Ricky Seals-Jones and Charles Clay, who presumably are the favorites to impact the offense led by first-year head coach Kliff Kingsbury. Vujnovich started two games and played in five before he ended the season on the injured reserve list. Lauderdale played for the Arizona Hotshots in the AAF this spring and has spent time in the NFL with the 49ers, Bills and Saints. Poutasi played for the AAF’s Salt Lake Stallions and was a third-round pick of the Titans in 2015.